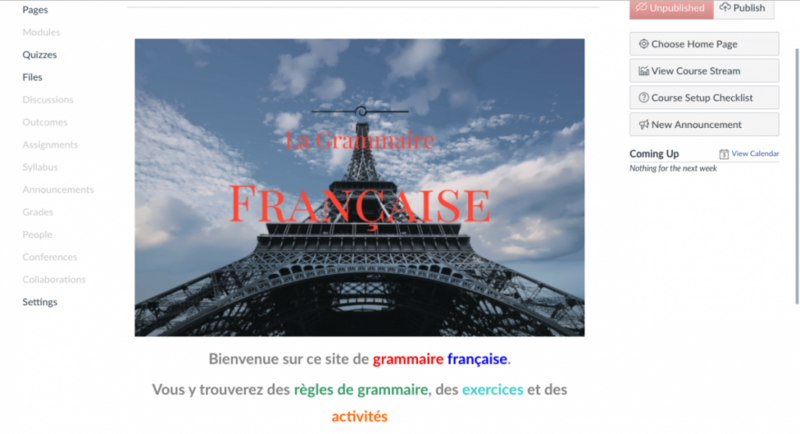 This project was assigned in June of 2017, and I was lucky enough to work with Professor Humbert from the Middlebury French Department on the creation of a French Grammar Website. The site is hosted on Canvas, an educational tool that schools like Middlebury purchase from Instructure. The goal of the project was to create an easy-to-use, well designed online space for Middlebury students to learn French at their own pace outside of the classroom. Professor Humbert also hopes that, when the site is finished, students from outside the Middlebury community can profit from it too. Canvas contains most of the tools to create an online learning space, but using the platform for what amounts to a comprehensive French grammar textbook was certainly challenging. I was able to use the built-in “quizzes” tool creatively to produce a variety of different learning challenges: from songs and oral comprehension to fill-in-the-blank question prompts. I also spent a lot of time making the work Professor Humbert had done prior to beginning work on the new site, such as creating exercises and grammar explanations, compatible with the new platform. This involved the conversion of many files from Word documents to PDFs. Finally, I was able to use the online design tool, Canva (not to be confused with Canvas), to create attractive and copyright-eligible designs for much of the site. I hope to continue working with Professor Humbert on this project, and that many students profit from the existence of such a site.